As the very first hospital in Germany, König-Ludwig-Haus uses the VirtaMed ArthroS™ to educate resident physicians. The arthroscopy simulator is an inherent part of the curriculum and receives positive feedback from young physicians. Dr. Stephan Reppenhagen also perceives a positive effect on the learning curves, way before their first guided procedure in the operating room. Dr. Stephan Reppenhagen is Deputy Head of the department for sports orthopedics and arthroscopy at the orthopedic hospital "König-Ludwig-Haus" at the Julius-Maximilians University in Würzburg, Germany. 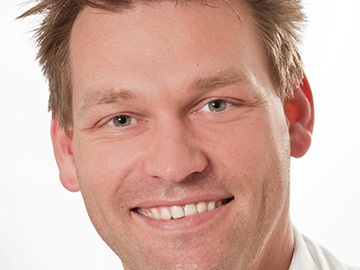 Dr. Reppenhagen, at the moment 24 resident physicians are being trained at the orthopedic hospital König-Ludwig-Haus. How exactly is this training being executed? We put a lot of emphasis on the theoretical background knowledge during education, as this is the basis for a successful surgery later on. Experienced surgeons give a structured approach on how to proceed, for every procedure there is an exact operative strategy. Our resident physicians acquire their operative skills step by step, spend a lot of time assisting in the operating room first, before being prepared for the correct approach under supervision of an experienced surgeon. What makes your center special as a training place? Our clinic covers the entire spectrum of orthopedics, both conservative and operative. In 2013 we have conducted about 1'300 arthroscopies, 850 out of those on the knee joint, about 300 on the shoulder and roughly 150 on ankle joint and elbow. Our specialization in various core areas allows resident physicians to see diverse patient cases and learn from experienced surgeons in the OR. Also, we have purchased the ArthroS™ as first clinic in Germany and use the simulator as an inherent part of the educational curriculum. What kind of skills can surgeons train on the simulator that they can benefit from later on in the OR, when doing surgery on a real patient? Especially handling the camera and other instruments, the stereo-tactical approach (triangulation), and the three-dimensional depth perception can be trained on the simulator extremely well. In the beginning, young physicians often struggle with orientation while working with a 30° optics for the first time. Also assessing depth perception on a two-dimensional screen has to be trained, and the simulator offers an optimal learning environment. One essential advantage is that there is no real patient involved, that means training in a risk-free environment is possible where potential risks for patients can be excluded during the training. This does not only unburden the educator but also relieves the resident physician. How exactly do you use the arthroscopy simulator? We have been able to collect first insight on the various possibilities of the simulator during a study on students and resident physicians with no prior surgical experience. According to the findings of this study we created a first educational curriculum that is supposed to be constantly modified and revised. At the same time we scientifically analyze the learning achievements constantly. We also use the simulator for student courses to give future colleagues an understanding of arthroscopy. Why did you decide in favor of the ArthroS™? We looked at other simulators, too, and then decided that the ArthroS™ is the best simulator on the market right now when it comes to usage options and exploitability. The simulator offers the opportunity to train multiple operative skills. This opportunity is very limited in the OR, and the simulator can be used any time without additional effort or staff involved. Resident physicians only express positive feedback. And we also found another advantage over traditional training methods: the playful element of working in virtual reality, the courses where only a successful surgery unlocks the next level of patient cases - that's just fun. The competitive element of comparing results motivates young surgeons to perform even better. Recently you have been to Moscow for a lecture. How did the surgeons there react to the simulator? It was a medical congress generally dealing with the optimization of education in the medical field, thus there were not so many surgeons and arthroscopists present. The feedback of the participants however was positive. The potential of those new developments and ideas for education is being rated as very high. How significant will simulation be in the future of surgical education? With advancing enhancement of the technical possibilities I think that simulation training will become an inherent part of the operative education of young surgeons, just as it happened with other professional training such as pilots in the aviation industry. What is more than certain for me is that training installations with the help of modern training simulators is a seminal area and the future of medical education.